Exclusive to ASUS motherboards, its UEFI (Unified Extensible Firmware Interface) is the first ever mouse-controlled graphical BIOS interface designed with dual selectable modes. It delivers a user-friendly interface that goes beyond traditional keyboard-only BIOS controls to enable more flexible and convenient input with quick scrolling. Users can easily navigate the UEFI BIOS with the smoothness of their operating system. Quick and simple overclocking and setup sharing is facilitated by the F12 hotkey BIOS snapshot feature. The exclusive EZ Mode displays frequently-accessed setup info, while the Advanced Mode is for experienced performance enthusiasts that demand far more intricate system control, including detailed DRAM information. 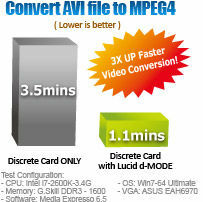 LucidLogix® Virtu is designed for the Intel® Sandy Bridge platform's powerful integrated graphics. Its GPU virtualization dynamically assigns tasks to the best available graphics resources based on power, performance and system load on Windows® 7 based PCs. It allows users to fully utilize the unique capabilities of advanced Sandy Bridge multimedia features alongside the high end 3D rendering performance provided by installed graphics cards. When no discrete graphics are needed, the graphics card is put in idle mode to lower utilization, heat, fan speed and power draw down to near zero, making the system more environmentally-friendly. 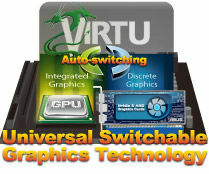 For users with diverse needs, LucidLogix® Virtu GPU virtualization provides great flexibility and efficiency. With switchable graphics, all ASUS P8Z68 Series motherboards leverage the transcoding power of Sandy Bridge, allowing users to enjoy three times faster video conversion with Intel® Quick Sync Video technology. Intel® Smart Response Technology boosts overall system performance. It uses an installed fast SSD (min 18.6GB available capacity) as a cache for frequently accessed data. Harness the combination of SSD-like performance and response with hard drive capacity, that's 4X faster than a HDD-only system. Unleash your performance with ASUS' simple onboard switch or AI Suite II utility. The TPU chip offers precise voltage control and advanced monitoring through Auto Tuning and TurboV functions. Auto Tuning offers a user friendly way to automatically optimize the system for fast, yet stable clock speeds, while TurboV enables unlimited freedom to adjust CPU frequencies and ratios for optimized performance in diverse situations. 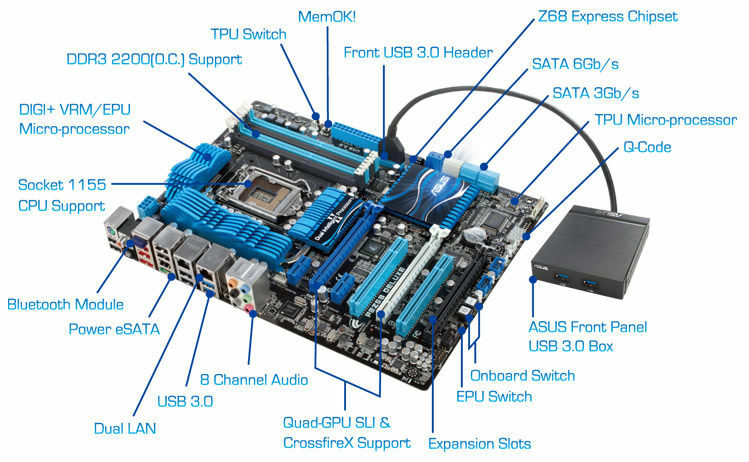 More links for "**B Grade** P8Z68 DELUXE Intel Z68 (Socket 1155) DDR3 Motherboard"